I saw this posted on my facebook page. 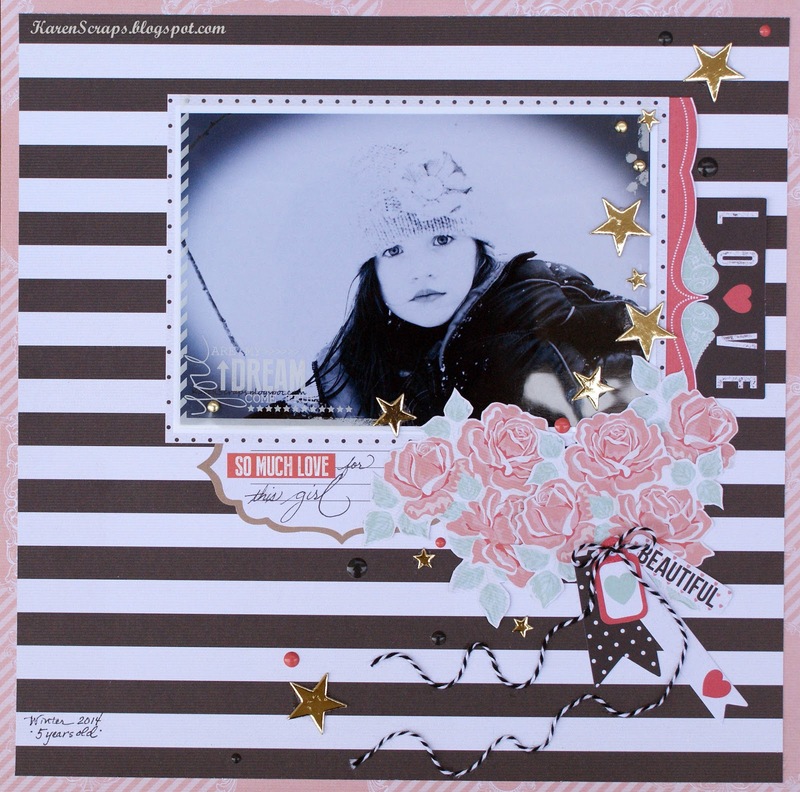 I instantly was drawn to the way Karen had added the touches of gold and added them on my photo overlays. I simply loved the simplicity and the wow factor at the same time. This is my SAVE THE DATE collection papers, tags, enamel dots, transparency photo overlays, and ephemera. I loved that she had journaled on my ephemera tags and that she also wrote down the date and the beautiful girls age. This collection is so pretty... and the textured paper feels like wallpaper. Note: this is not at all a wedding layout. YOU can use this product for so much more. Thank you Karen for posting this project on my facebook page. It is stunning and I really enjoyed seeing your creation. Well, I am working non stop on some BIG massive projects. My new mid-release came in this weekend and it's all about creating projects for the debut in about a week. It just goes so fast! Please note: I may be slower to respond for the next few days. I am going on 14 plus hour work days at my office. PPS Who ever has sent me flowers for the last three days... THANK YOU! I have no idea who is sending these to me, but I am thankful. They are gorgeous and so thoughtful. I am one very LUCKY girl. I am touched beyond words. I love what she did!! That paper is the type of paper you really don't want to use. You'll need to buy two - one to look at and one to use. That's for us paper hoarders out there.